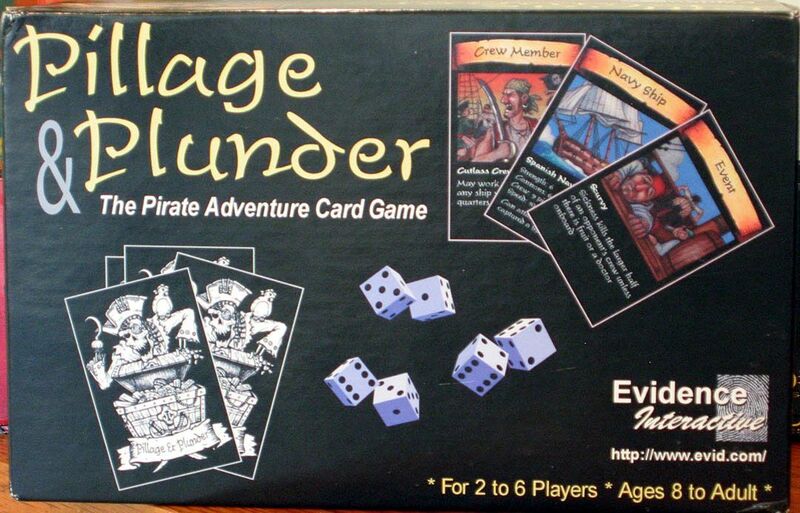 Taken from www.evid.com (Evidence Interactive Website) : Pillage & Plunder is a pirate-themed, strategy card game that features 298 full-color, high quality playing cards with original artwork by artist Josh Fisher. In Pillage & Plunder, you take the role of a pirate captain. You sail in a dangerous sea full of rival pirates, heavy-laden merchant ships, pirate-hunting naval vessels, and forces both natural and supernatural. During your adventures, you will buy ships, outfit them with officers, crewmen, cargo and supplies. You will engage in cunning pirate attacks on merchant vessels and on other pirates. You will embark on treasure hunts and engage in commercial trade. Your objective is to become the first pirate in the game to amass 25,000 pieces of eight, to eliminate all the other players from the game, or be the pirate with the most wealth when the cards are exhausted.